According to Dr. Anna O’Brien, a veterinarian, a study was conducted at the University of Glasglow, and it led researchers to the conclusion that various types of honey have antimicrobial properties that could help inhibit the growth of bacteria often found in horse leg wounds. Also, another Glasglow study claims to have discovered agents in honey that are seemingly effective against MRSA infections. If true, this could be helpful for other infections that may not heal as fast because of resistant bacterial infections. Honey has commonly been used as an antiseptic—an old practice—but these studies are being conducted to trying to find out which kind of honey, if any, is the most effective. Like the Glasgow researchers, Dr. O’Brien believes Manuka honey, the organic honey originally from New Zealand, is the best honey for wound care if one were to use honey. She claims to personally avoid using medical grade honey, instead using Manuka honey for minor wounds, but she is still rightfully cautious when mentioning the product to her clients. O’Brien started considering Manuka honey after the Glasgow University studies researched store bought honey, and she came to the conclusion that they encouraged bacterial growth and overall had the opposite effect of an antiseptic. “When cultured for bacterial growth, 18 out of the 29 different types of honey grew bacteria or fungi, meaning they were contaminated.” O’Brien insists this shouldn’t scare people from eating honey and ensures that anything from the local grocery store is bound to grow some harmless bacteria. 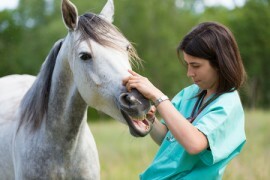 However, for medical reasons, people should not try it for treating their wounds or their horses’ wounds. Despite some brands of honey having supposed benefits, O’Brien doesn’t advise drowning horse wounds with whatever bottle of honey you may happen upon. She does encourage an honorable mention when talking to clients, but again Dr. O’Brien only applies Manuka honey wraps to minor wounds that don’t involve bone, joint, or soft tissue exposure. O’Brien is still testing honey on wound cases since the honey is accessible through medical suppliers. She believes, in her opinion, that the science behind it all is valid and could be apart a new regime in healthcare. Caramelized Brussel Sprouts You Will Fall In Love With!Light Therapy Protect From Pesticide Poisoning?